L: 84" x W: 38.5" x H: 41"
Rossdale Power-Reclining Sofa Soft and inviting is exactly what you'll get in your living room with the Rossdale power-reclining sofa. Family-friendly microfiber upholstery, stylish topstitching and a rich hazelnut color make it attractive and versatile. Enjoy the convenience of power-reclining seats and USB charging ports, as well as thick seat cushions and pillow arms for a relaxing night in. Soft and inviting is exactly what you'll get in your living room with the Rossdale power-reclining sofa. Family-friendly microfiber upholstery, stylish topstitching and a rich hazelnut color make it attractive and versatile. Enjoy the convenience of power-reclining seats and USB charging ports, as well as thick seat cushions and pillow arms for a relaxing night in. Fully reclines with 6" wall clearance. perfect sofa - very relaxing. I got it on sale and price was terrific. Very much comfortable and style is going to be there for many years. My family and I love this couch. looking very nice in our living room. Super comfortable couch, love to take it all the way back and just relax. Once you sit down you won't want to get back up. a little bit harder than what I expected, overall it is fantastic! We originally narrowed our search down to an unbelievably soft comfortable power recline couch but cheap and a beautiful expensive leather couch power with usb. The leather couch was just too far out of our budget for what we needed so we went back to look at the cheaper couch at a different store and when you sat in it you could feel the wooden frame coming through some parts of the cushion. So back to Raymour, The leather couch felt cold and it did look a little weathered. We started looking around and came across the Rossdale. It seemed to be the perfect combination of what we liked in both the other couches. It was soft but not mushy, and had the USB ports, it reclines out like a bed, the power incline and recline are very fast and it was comfortable to lay down sideways without reclining. Price was also exactly where we wanted to be including the warranty. The only thing I will say is the color of the couch in the show room and in the photos is more of a mottled beige which was my second choice. I could not believe when the couch was delivered that it was more like a charcoal gray which was exactly what I was looking for originally!!! Could not look better in my living room and I have to say it’s one of the most comfortable couches we’ve ever owned. Great buy, I highly highly recommend it. Great sofa - very comfortable and so relaxing in full-recline mode. You don't want to get up! The delivery service was excellent. They had no problem maneuvering the stairs, including a turn for a second floor apartment. All-around a great buy. Couch is very comfortable and well built. Both sides are power recliners which can be adjusted ever so slightly. The microfiber cloth is beautiful and although we haven't had to wipe any stains off it seems it would be easy to do using just water and a microfiber cloth. I highly recommend this sofa to anyone in the market. Our salesman was easy to work with as well. We have had our new couch for a week now. We love the look and comfort of it, and I love that the dog hair easily vacuums off. We are very pleased with our decision. This couch is absolutely perfect for our needs. It is well within what we budgeted for and exceeds our expectations. LOVE our new sofa! We were limited on space in our little Townhouse and the 84 in. 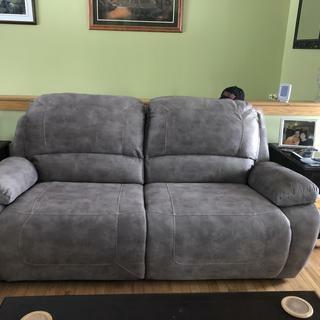 Rossdale power reclining sofa fit the bill. Stylish and comfortable and the best part is that we can both lay on the couch with plenty of room to spare. Just lovely! So comfy and so affordable. What a wonderful sofa at a great price. It was delivered in 3 days and the delivery guys were great, they explained everything and were very professional. The sofa is firm but comfy and I love the full reclining position, you won't regret buying it. We chose this model for the wide cushions....and firmness. I can easily curl up while watching TV, and just nod off. Love the electric push button controls. One surprise...the back cushions are easily removable for moving day! I have had this sofa for a week now and my fiance and I both love it. Reclines back pretty far too! Really love our new Rossdale sofas! Very comfortable and nicer in person even than online - material is soft and stitching is nice looking. One of a kind comfort!!!! 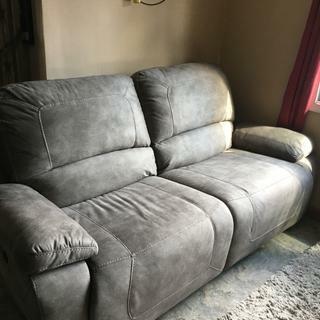 As a retired veteran who has lived all over the US and several foreign countries, I can honestly say the Rossdale Power-Reclining Sofa and Loveseat we purchased from RnF is the best design and most comfortable pieces we have ever owned!!!!! Let me start by saying everyone, and I mean everyone that works there is friendly and committed to providing a great customer experience. This sofa is made in China, but the quality couldn’t be better. Very well built. Firm but very comfortable and cozy for cuddling couples. Also big enough to lounge on solo. Could use just a tad bit more head cushion. We bought matching sofa and recliner. So comfortable and the USB ports are a nice added extra. Delivery was also prompt and courteous. Strong piece of furniture and yet very comfortable. Affordable reclining sofa that’s functional, stylish and comfortable. I love this sofa. It is stylish and was reasonably priced. It’s very comfortable. It is equipped with USB ports so you can charge your devices and work in comfort. Works well with many different styles of coffee and end tables. Super comfy. Has a usb outlet on both sides of the chair. Happy with purchase. Love me some Raymour & Flanigan! Bought the sofa last weekend and used it for couple of days now. It’s so comfy and nice. It can stretch out almost like a bed.Ideal for couples. Me and my wife love it! The material is soft and easy to clean, the USB outlets are super convenient, the sections recline very gracefully, it is so comfortable, and there is plenty of room for 3-4 people. Very well made furniture. You definitely get what you pay for! We loved our new set and relaxed for the evening with with a movie! It's very comfortable and relaxing! I would gladly recommend this product for those who are looking for quality and unquestionable satisfaction. Loving the new furniture! The power reclining feature is so much easier for short people. Very comfortable. Extremely durable and looks great! Solid frame , small size but doesnt sacrifice comfort. 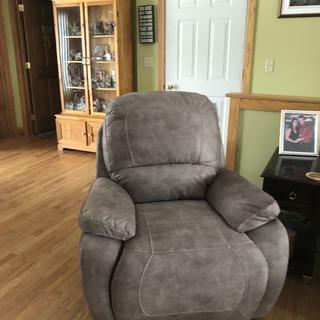 My wife and I were looking for a good dual recliner for relaxing after the workday was done. This fit the bill better than I could have hoped. Each seat is extra wide so 2 people can sit with plenty of room. You could easily fit a few kids in between two adults. The best thing though is with both sides fully reclined, it acts more like a large bed. This makes cuddling with the wife and pets incredibly relaxing and is the second best furniture buy I have ever made behind our bed. The USB ports on each end are a nice icing on the cake. I purchased this sofa for my aunt and she loves it! I’m actually thinking about purchasing one for myself. We both love how comfortable it is and how far back we can recline. And you can’t beat the price! Great sofa. Love the power! This couch is the best. It is comfy to lay across the couch, the divide in the middle isn't prominent. The power reclining is awesome. The dogs scratch at it and it wears well. I love it. I absolutely love my recliner! It’s so spacious and comfortable. I am glad we chose this one. Not as big as a couch but bigger then a love seat. Extremely comfortable sofa is perfect for a small space. Delivery was fast and professional. Ordered for an older parent. Fantastic gift! The leg lift is smooth and quiet. The USB charging port is a nice feature being used daily. Color is neutral and goes with many existing furniture color palettes. Great product. The couches are wonderful. Very comfortable. The delivery men were courteous and polite. I like everything about the couch. 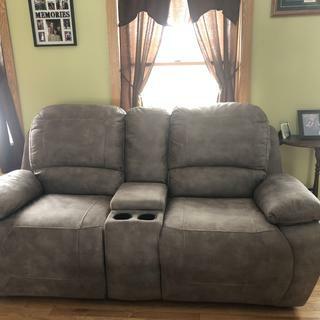 It is roomy and comfy for my husband, kids and I to relax and watch a movie on. Our sale rep was amazing as well! I’m happy with my purchase. Thank you. BEST ANSWER: The weight capacity is 250 lbs. per seat. BEST ANSWER: The Rossdale collection is manufactured in China.